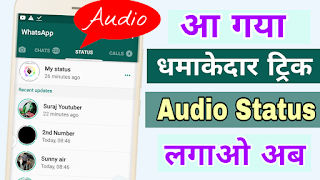 WhatsCut Pro is most powerful and smart tool to create and share videos / audios on multiple social media platforms and chat messengers: Whatsapp, Instagram, Facebook, IMO etc. ★ Upload long videos or audio files as your social media or chat messenger status. ★ One mobile application to update video/audio status on all social media platforms or chat messengers like: WhatsApp, Instagram, Facebook, IMO etc. ★ Automatically split video / audio into 30 second parts to share as WhatsApp status. ★ Do not require permanent phone storage space. ★ A unique tool to record audio and share it. Note: Whatsapp, Instagram, Facebook, IMO etc. can support max 30 status at a time, so file manager only lists videos of length less than 15 mins.